we are committed to deliver the fruits of development to each and every citizen of Arunachal Pradesh -says chief minister Pema Khandu in his Republic day message to the people of Arunachal. …………read below the complete message. 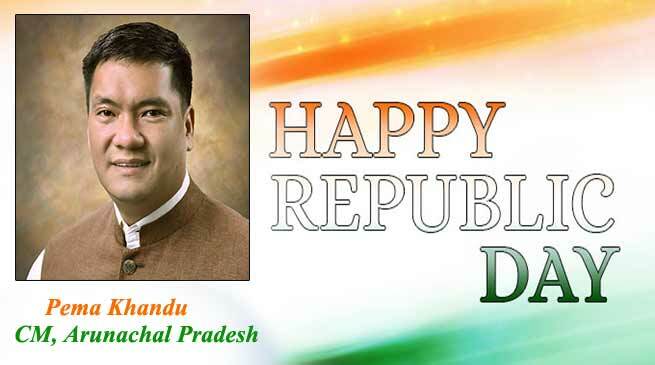 On the historic occasion of 69th Republic Day, I deem it a great privilege to extend my hearty greetings to my beloved people of Arunachal Pradesh and pay rich tributes to all those great souls whose struggle and sacrifices made India a free country. This is the day which reminds us of those great luminaries who framed our constitution and gave as a democratic, republic, socialist and a secular nation. On this momentous occasion, let us all pay our rich tribute to the valiant soldiers of our great Indian Army, Para-Military Forces and State Police who sacrificed their lives for us so that we live in peace and feel secured. We have just stepped into a promising new year that ushers in new hopes and expectations. However, the past one-year had been a year of happenings. Our Government took many important decisions and brought in numbers of administrative reforms, a firm step to take Arunachal Pradesh at par with other developed States. Under the continued support and guidance from our beloved Hon’ble Prime Minister Shri Narendra Modi, we are committed to deliver the fruits of development to each and every citizen of Arunachal, especially to the last man in the queue with full dedication and conviction. Success of Arunachal Pradesh depends on keeping the state free of corruption. Corruption is the only stumbling block which if tackled sincerely, our State with its resources can outgrow many states in the country. We are fighting corruption to ensure that few people do not amass wealth at the cost of other’s opportunity to grow. Our Government will not tolerate corruption in any form and will not think twice to take stern action against anyone found involved in corrupt practices. We recently handed over the infamous multi-crore Public Distribution System (PDS) scam to CBI for an independent investigation. We have also cancelled illegal regularisation and recruitments done in various departments and ordered for SIC investigation into the anomalies. For any state to progress, connectivity of all form is mandatory. In this regard the State Government is giving top priority to the connectivity sector -Road, Air, Rail and digital. While over fifty thousand crore rupees is being pumped in for road network in the state, rail connectivity got a major boost this year. While new railway lines from North Lakhimpur – Ziro and North Lakhimpur-Silapathar-Bame-Aalo has been approved, surveys of Margherita-Deomali-Lekhapani-Kharsang-Itakola-Seijosa has already been completed. Surveys in some major rail route like Bhalukpong-Tenga-Tawang, Pasighat-Tezu-Parashuram Kund-Rupai, Dumduma-Namsai-Wakro, Dangri-Roing, Deomali-Naharkatia, Kharsang-Miao-Nampong-Deban, Tinsukia-Pasighat via Kanubari are in various stages of progress. Under Air connectivity sector, operationalisation of ALGs at Pasighat, Ziro, Tezu, Mechuka and Tuting for civilian use is in full swing. Small fixed wing aircrafts and helicopters will be operated under UDAN in select locations very soon. In order to make digital connectivity reach the last habitat of the state, a massive 1893 towers under Comprehensive Telecom Development Plan for Rs. 1739 Crore is being constructed. Our Government shall provide incentives to private telecom operators for setting up telecom facilities in remote border districts of the state. Keeping social sectors like health and education on high agenda of the government, we have started smart class room project stretched to 700 schools across the state. We have also created sufficient posts of subject teachers to fill the critical gap while we have also done away with the no detention policy which has been hampering the quality of education. Under health sector we started CM’s Free Chemotheraphy scheme for cancer patients. The first academic session of Tomo Riba Institute of Health & Medical Science with initial capacity of 50 students will start this year. All modalities have been completed to relaunch the restructured health iassurance scheme this year. Our government has initiated a number of steps to tap the rich potentials in Agri-Horti and allied sectors under “Mission Organic Arunachal”. A tourism road map with focus on high-end Tourism has being prepared while hydro power is being harnessed with people’s consent, factoring in its environmental effects. We are giving emphasis on employment generation of youths and inculcating the spirit of entrepreneurship through programs like Deen Dayal Upadhayay Svalamban Yojana and Deen Dayal Updhayay Bunkar Yojana. We believe in the mantra of people-oriented holistic development through an efficient work culture in every sphere. Therefore, our Government is taking up Prime Minister’s vision of Digital India Campaign in right earnest. We have already started the electronic paperless office and launched several programs for quick, transparent and accountable governance under Digital Arunachal Mission. On this momentous occasion, while reposing our full faith and trust on the stewardship of Shri Narendra Modi as the Prime Minister of our great nation, we stand by his side in building a strong nation which believes in “Sabka Saath Sabka Vikas”. I reiterate that our government firmly believes in working with a team spirit. With each one of you as members of “Team Arunachal”, based on unity and collective responsibility – will be the core force to bring new strides of development in our beautiful state. On this auspicious occasion, I call upon all my brothers and sisters of Arunachal to join hands and be responsible members of “Team Arunachal”. Jai Hind ! Jai Arunachal ! Itanagar: Who will take care of High Mast Light poles…?